You'll docked in Ordinance Island a few steps from King's Square. Ships too large to dock in town will anchor in Murray's Anchorage near Fort St. Catherine and be tendered, a one hour tender trip to Penno's Wharf. The oldest and most historic settlement on the island is likely to hold the greatest fascination for architecture buffs. Due to its status as a World Heritage Site, there are many fine old, colonial streets and buildings to immerse yourself in; streets and alleys with fanciful names such as 'Featherbed Alley', 'Old Maid's Lane' or 'Needle and Thread Alley'. However, the best thing to do upon arrival in the town is head for the main King's Square. King's Square was the original main square of St. George and here you can see the Town Hall, the Visitor's Service Bureau and Ordinance Island across the a small bridge directly to your south. During the tourist season (May-September), actors in period dress provide colour to the community as acting as town criers or sentencing men or women to the stockades, pillories or the dunking chair. All locations in and around Saint George are easily walkable. 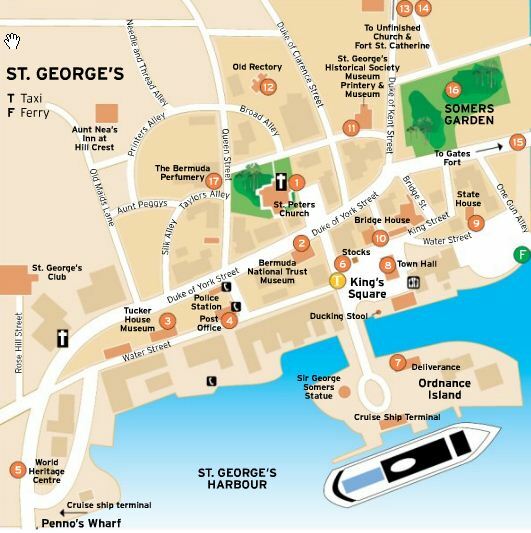 For $2, hop on the year-round St. George's Mini-Bus.They depart from King's Square in St George. The lady in the Visitor Information center will point out the minibus if you are unsure. The Visitor Info Booth beyond the gift stand sells the unlimited Day Pass for buses & ferries ($12 for 1 day or $20 for 2 days) – printed bus & ferry schedules are given, along with a mini Bermuda guide. The best beach by far is Tobacco Bay. It is a protected bay that offers snorkeling for all levels, swimming and sunbathing. Take the Duke of Kent Street north from the town center and you will see a sign that reads "Tobacco Bay", and it is an easy walk up the hill towards the bay. You're shopping duty-free, so that means prices are at least 20 percent less than the U.S.
Legal tender is the Bermuda dollar, which is divided into 100 cents. BD$1 = US$1. U.S. currency is normally accepted in shops, restaurants and hotels, but currency from Britain, Canada and other foreign countries is not.